“Should I stay or should I go”, sang The Clash and I too was wondering what to do when I pulled up to the new lake(s) last week. Autumn was upon us and the main lake was closed for landscaping, pruning and de-silting, so the only option was the (very) small one, or do I go back to the other lake – Overnight Success – and all the issues that that could bring; as The Clash sang “If I go, there will be trouble” but loitering in the car park, “This indecision’s bugging me”. I decided to stay put rather than drive the half hour, plus I had limited time as I had to be back to collect the twins from school. As I walked around the small lake it gave up very few clues as to where the carp were. I settled on a spot that had a tree lined bay to my right and open water and two large areas of pads out front. The locations looked good even without any shows to speak of. 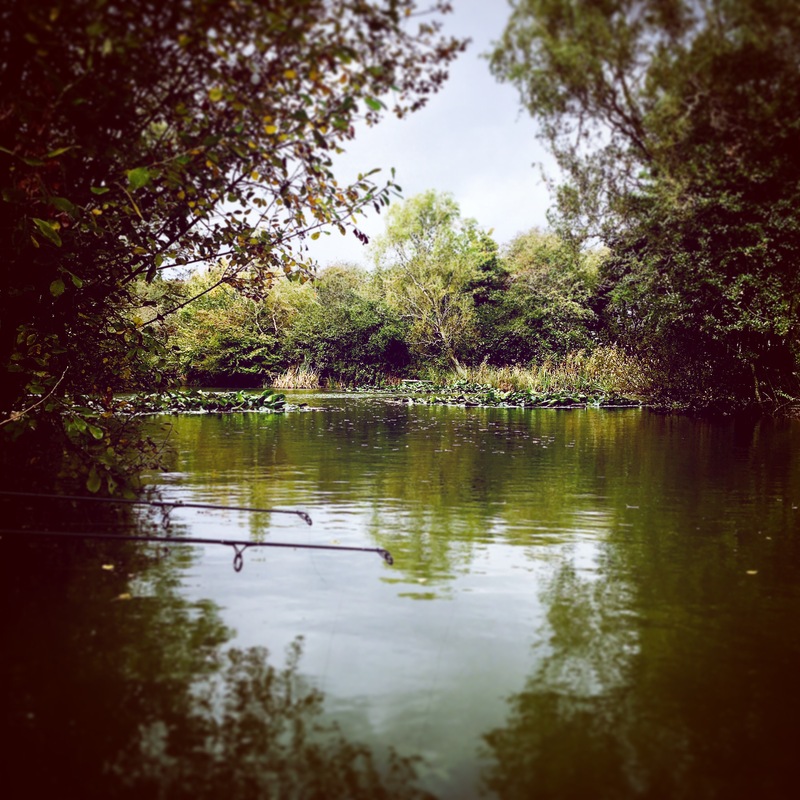 I primed a couple of likely looking spots with a mixed bag of boilies and set about getting the rigs and rods ready – Dynamite Red Amo, BaitTech Triple N and new to the party DT Baits Supa Fruit. The ‘bay’ rod was a simple lob to the reeds, and the ‘pads’ rod was a short cast to what I hoped would be a patrol route between the lily’s. The former was a Ronnie presentation, and the latter a KD come snowman stylie. Both baited with Supa Fruit. Now this lake supposedly has carp 28lb, but not many. So when I did see a couple of shows in the area, they were small commons. But I thought any fish in the swim might attract bigger prey to the mix of boilies, hemp and corn. What I did not expect was the chainsaw and subsequent bonfire on the large lake to be so intrusive. The noise shattered the peace and the smoke made me think that bonfire night had come early, I just needed some fireworks from the spots! BANG, the ‘pads’ bobbin crashed into the blank but I did not connect to the fish; promising I thought. And unfortunately that was how the rest of the session panned out with one more aborted take. I knew there were fish in the swim, as I could see the line under the rod tip dip back and forth, “It’s always tease, tease, tease”. I even switched to a zig for the last hour, moving the ‘bay’ rod towards the pads but to no avail. So having ‘Stay[ed]’ it was time to ‘Go’ with Jo Strummer’s and Mick Jones’s words still rocking my mind. Perhaps on reflection it was the wrong decision and I left thinking about the next time I would be doing Combat [Rock] with the carp. Thank you a bunch for sharing this with all folks you actually recognize what you’re speaking about! Bookmarked. Kindly also discuss with my website =). We could have a link alternate arrangement among us! You actually make it seem really easy together with your presentation however I in finding this topic to be actually one thing that I think I might by no means understand. It kind of feels too complex and very extensive for me. I am taking a look forward for your subsequent put up, I will attempt to get the cling of it! I am now not positive the place you are getting your info, but good topic. I must spend a while learning more or understanding more. Thanks for magnificent info I was searching for this info for my mission.